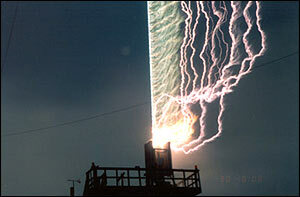 Lightning does emit X-rays, scientists have confirmed. A new study settles a long-standing debate dating back to 1925 when it was first suggested that thunderstorms might produce high-energy radiation. The induced lightning hit a specially constructed tower, allowing the team to study the discharges in detail. They measured intense bursts of X-rays, gamma rays and fast-moving electrons - just before each visible flash. The bursts typically lasted less than 100 microseconds. "I think it's really exciting," said co-researcher Martin Uman. "We didn't expect to see anything at all, and then, all of a sudden, with almost every lightning stroke, we had X-rays." The presence of X-rays has been suspected for some time (recent data have hinted in this direction), but confirmation has proved difficult because of the sporadic nature of lightning and the electromagnetic "noise" it generates. Uman, Joseph Dwyer and colleagues suggest that the breakdown of air - the process thought to generate the X-rays - is an important process for lightning and other atmospheric discharge phenomena. The X-rays and other radiation may be generated when large electric fields manipulate electrons during the "dart leader", the phase that creates a path from clouds to ground for the lightning to follow during a strike. "These results provide strong evidence that the production of runaway electrons is an important process during lightning," the researchers wrote in the journal Science. The technique used to trigger and control the strikes is a hi-tech version of the famous kite method for inducing lightning bolts used by Ben Franklin in 1752. Researchers hope it can be further developed to study phenomena such as sprites, the strange lightning observed by jet pilots above clouds.